There is very little written on the topic of disability and disaster, with the issue almost completely ignored until relatively recently in both the academic literature and the world of policy and practice (Alexander et al. 2012: loc. 11130). Very little has been written to date that could be considered critical or provide substantive alternative discourses to mainstream, traditional views regarding disasters and ‘vulnerable groups’, such as people with disabilities. 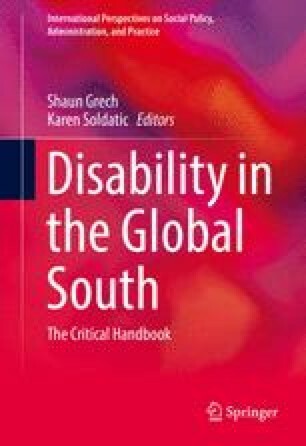 In order to contribute to this incipient body of scholarship, this chapter takes a critical approach to disability and disasters by interrogating some of the key trends in the study and practice of disaster risk reduction and management through the lens of disability. We begin by setting out some of the conceptual parameters of current debates in disaster scholarship, and then analyse existing data on disability and disasters and the current growth in awareness and recognition by the international community of the importance of disability-inclusive disaster risk reduction and humanitarian action. The chapter compares and contrasts some key commonalities and intersections between disaster and disability theory, utilising conjoint concepts as a way to analyse emerging trends regarding vulnerability and resilience approaches in disasters and humanitarian emergencies. Vietnam is used as a case study to illustrate how these concepts are enacted in the real world with other countries introduced when appropriate. Duffield, M. (1994). Complex emergencies and the crisis of developmentalism. IDS Bulletin, 25(4). Retrieved February 21, 2008, from http://www.ids.ac.uk/go/publications/ids-classics.